« Nativars — what are they and why should you care? 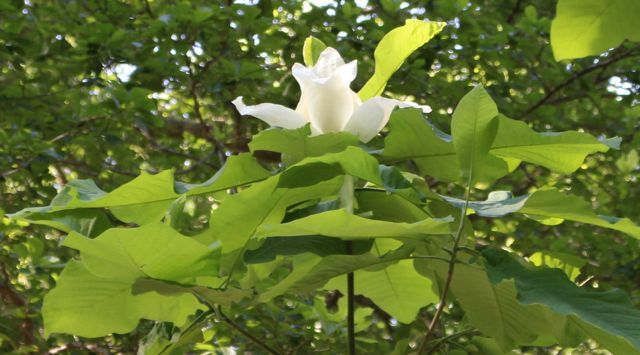 I freely admit that I think our native deciduous magnolias are very special trees. Yes, I love the drama of our evergreen Southern Magnolias as much as the next person, but the big-leaved deciduous magnolias provide even higher theater for those willing to accommodate their needs. I took all these pictures of my Ashe Magnolia today. This relatively small, somewhat lop-sided tree blooms for weeks — blooms on top of blooms, as you can see from the first photo. And the blooms are enormous, as are its leaves. As soon as the buds begin to open, the flower’s perfume scents the air. I can’t imagine a blooming tree with more wow factor than Ashe Magnolia. As the flowers fade, piles of spent stamens collect on the petals. And, oh yes, the perfume still sings. 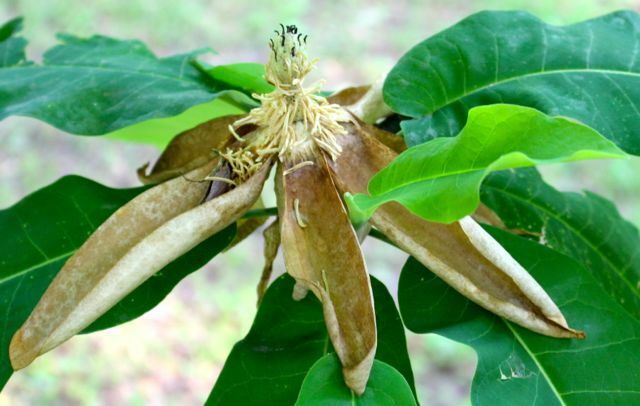 As the seed cone grows, ivory petals turn parchment brown, eventually falling to the ground, stamens tumbling after. 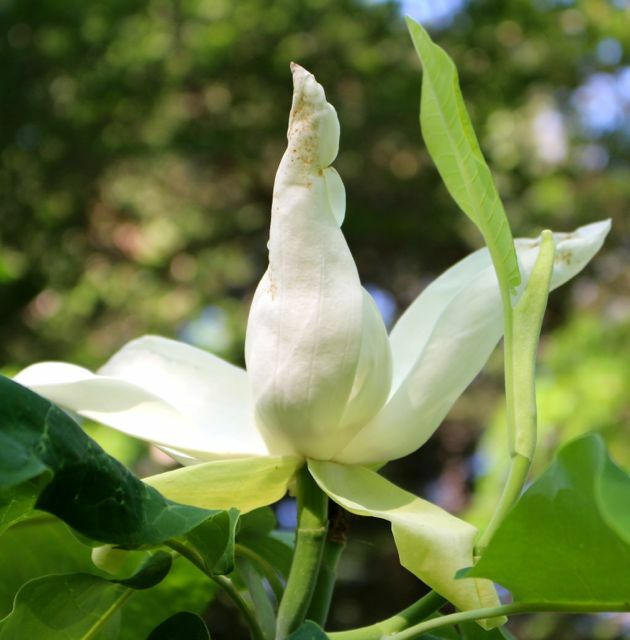 I sited my thriving Ashe Magnolia on the north-facing side of my yard inside a deer-fenced area beneath tall canopy trees that give it ample shade. It likes soil moisture, so I planted it on the bottom of the slope. After pampering it for a year, I’ve done nothing except admire this amazing tree. Late freezes have knocked it back several times, but it just resprouts and continues to bloom more spectacularly every year. Oh, how I love this tree! But wait — there’s more big-leafed news. My Magnolia macrophylla, Bigleaf Magnolia, is about to explode into bloom even as its smaller cousin, Ashe Magnolia, continues its display. Our Bigleaf Magnolia is now about 25 feet tall, and the flower buds are way over my head, so forgive me for these less-than-optimal photos. 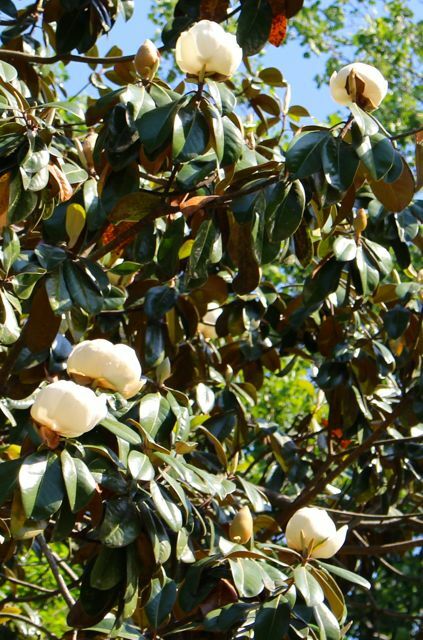 However, you do get a sense of the scale of the leaves of this mighty Magnolia, and the size of the buds relative to the leaves. These leaves grow longer than the length of my arm every year, providing a somewhat tropical look to my landscape. 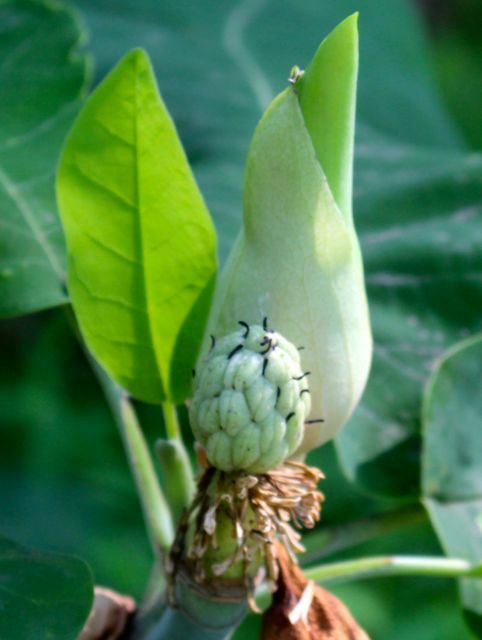 I can see at least 15 flower buds on the Bigleaf Magnolia, and I suspect there are more too high for me to easily see. The flowers are opening quickly, thanks to the onset of our summer heat. I don’t think they’ll last long, given that we haven’t had a decent rain in four weeks. But for now, I will stand beneath this growing beauty admiring the blossoms and leaves, and inhaling the fragrance. Aroma therapy at its best. Southern Magnolia flowers just beginning to pop open. Not to be outdone by her deciduous big-leaved sisters, my Southern Magnolia is about to explode into her own floral display. My tree is 50 feet tall, and I don’t even want to try to count how many flower buds it has. For certain, as our air humidifies and heats up later this week, I know every sultry morning will be heavy with the perfume of her blooms. 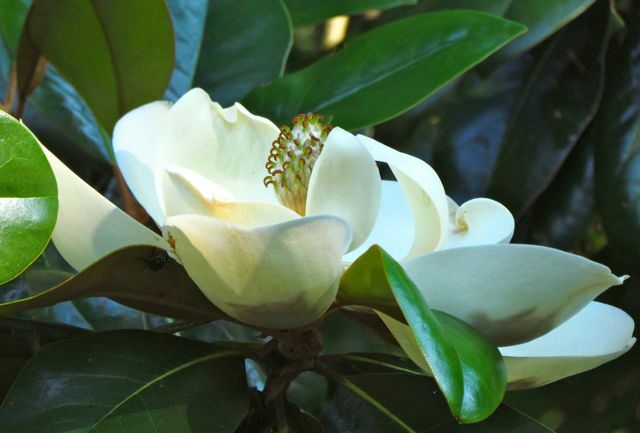 Flowers of Southern Magnolia are not as large as those of her deciduous sisters, but she produces more petals per bloom, creating her own kind of floral drama. As the flowers open, this tree will hum with day-long visits from my neighbor’s honeybees. Southern Magnolia and her big-leaved sisters signal Summer’s arrival. Here’s hoping your Memorial Day holiday is as sweet as mine promises to be. This entry was posted on May 24, 2015, 4:36 pm and is filed under Favorite Plants, piedmont gardening. You can follow any responses to this entry through RSS 2.0. You can skip to the end and leave a response. Pinging is currently not allowed. I just came in from admiring the first blossom on my Sweetbay, Magnolia virginiana. Hard to beat that lemony fragrance. Our options for North American magnolias are more limited in zone 5, but I know of another, cold-hardy, large-leaved magnolia: M. tripetala. I used to admire the tropical-looking tree on the St Paul campus of the University of Minnesota, in balmy zone 4! Alas, no evergreen magnolias here. 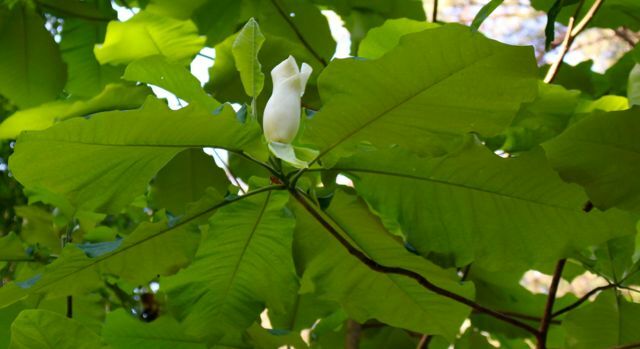 I did not realize M. tripetala was quite so hardy, although it is the native deciduous magnolia of the southeastern Piedmont region, so I guess it’s not too surprising. I am lucky enough to have a large Umbrella Magnolia (its common name) growing beside my creek. It blooms at the same time my M. fraseri blooms, which is ahead of the the three magnolias I mentioned in this posting. Umbrella magnolias are gorgeous trees. Mine is currently 25 feet tall and blooms reliably every year. 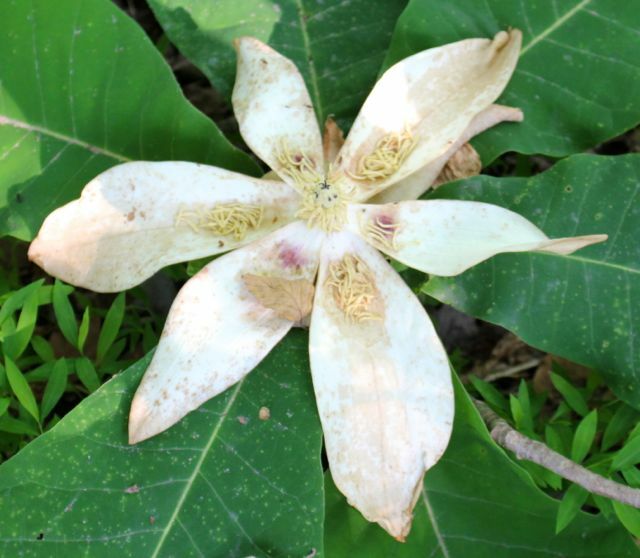 I’m glad this tropical-looking member of the big-leaf magnolia clan is tough enough for your local growing conditions. Enjoy!